Burr’s devotion did not come out of nowhere. Earlier on the same day of his vote, he held a news conference with the leading Democrat on the Senate Energy and Natural Resources Committee, Maria Cantwell of Washington, calling for a permanent reauthorization and full funding for the popular public lands conservation program. His vote also offered the first volley in the impending negotiation to reauthorize the program ahead of its Sept. 30 expiration. 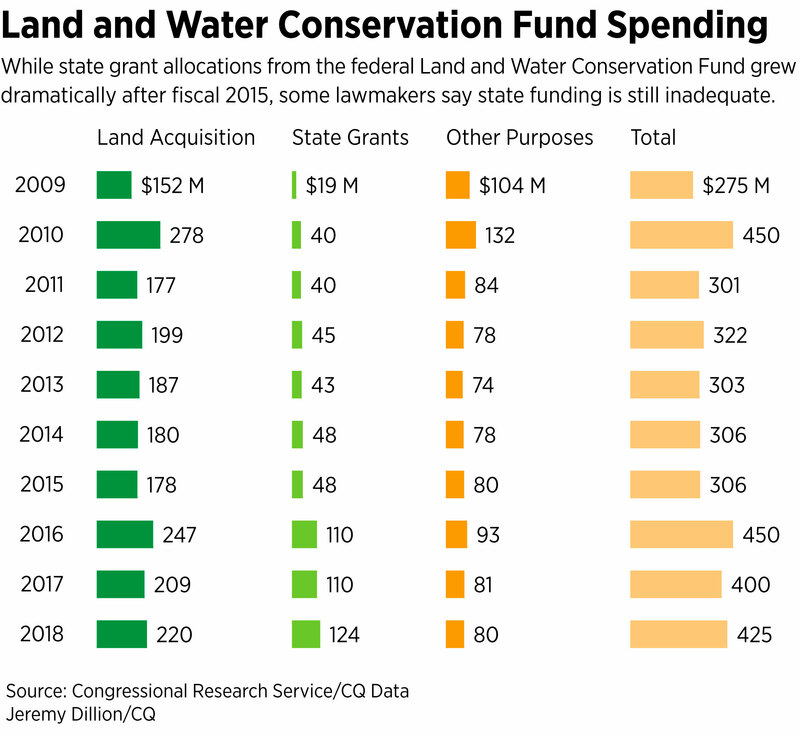 But to get there, Burr and fellow LWCF supporters will need to convince skeptical House GOP lawmakers to move legislation to keep the fund alive. The Land and Water Conservation Fund was created in 1965 with bipartisan support to protect national parks, water resources and wildlife areas and make them available to the public for recreation. The fund gets most of its money from a portion of the profits derived from offshore oil and gas development, which Burr repeatedly highlighted as a zero cost for taxpayers. Without reauthorization, the program could be exposed to uncertainty that derails conservation projects and strategies that are years in the making, according to leading conservation groups. That uncertainty has the potential to upset state and local communities’ plans to better and more actively participate in the $887 billion outdoor recreational economy — a massive economic engine for rural areas. No more so than for Burr’s home state of North Carolina, where population trends show an influx of people that outpaces the national average. With more people come more desires for recreational opportunities, and the state’s rolling hills and forests represent prime opportunities to meet those demands, although they could use some work to meet their full potential. And that’s where the fund can help fill in some gaps, said Tom Cors, a North Carolina-based director of lands policy with The Nature Conservancy. He pointed to efforts to build out the Overmountain National Historic Victory Trail across Virginia and stretching through Tennessee, North Carolina and into South Carolina; or the Uwharrie National Recreation Trail in the central part of North Carolina; as well as work on the North Carolina stretch on the Appalachian Trail or the Blue Ridge Parkway. “[Burr] has long seen the benefit of LWCF conservation in terms of supporting local economies and recreation economics, and he’s been a champion for quite some time,” Cors said. Burr is not alone in seeing the benefits of the fund for recreational opportunities. During that news conference, he was joined by fellow Republican Sens. Cory Gardner of Colorado and Steve Daines of Montana, two conservatives not known for their environmental record, but who nonetheless support a reauthorization. Environmental groups have noted the Republican support for the program, and are trying to leverage it to move legislation forward on Capitol Hill. In response to the rescissions bill vote, which Daines and Gardner supported even though it cut $16 million from the fund, the League of Conservation Voters launched a $50,000 digital ad campaign targeting those two senators for voting for the cuts after appearing at the LWCF news conference. The fund’s authorization expired for the first time in its history in 2015 after Republicans and Democrats could not agree on how or if the program should change. Three months later, the fiscal 2016 omnibus appropriations bill included a provision to reauthorize it for an additional three years without changes, with an eye on working toward a reauthorization. Foremost of the legislative proposals kicking around Capitol Hill is a bill sponsored by Burr and 12 other senators from both parties that would permanently reauthorize the program. The House version, sponsored by Rep. Raúl M. Grijalva, an Arizona Democrat, has 229 co-sponsors — more than a majority of the chamber. Burr also has legislation with Cantwell to permanently reauthorize the program and to mandate spending of the funds collected. That bill has 43 co-sponsors, but only three Republican backers. A permanent reauthorization was included in the broad energy policy and natural resources bill passed by the Senate last Congress that did not become law. As part of that bill negotiation, Murkowski and Cantwell reached a compromise that would have split funding for the program with 40 percent on the federal side, 40 percent on the state side and the remaining amount up to the discretion of appropriators — which could prove a likely outcome to upcoming discussions. “You are literally hampering what is critical outdoor recreation and economic development, and in some ways you are just making everything more expensive in the long run with the longer it takes to get the acquisition,” Cantwell said about the need for certainty. House Republicans, especially from Western states, have criticized federal involvement and management of the program. Citing a growing deferred maintenance backlog and increasing land acquisition costs, lawmakers like House Natural Resources Chairman Rob Bishop of Utah have said they want to overhaul the fund with more state control of the program’s implementation. The Trump administration has echoed that view. In its fiscal 2018 budget request, the Interior Department proposed no new funding for land acquisition under the LWCF. Interior Secretary Ryan Zinke also met criticism on Capitol Hill in May for the slow deployment of LWCF appropriations allocated in the fiscal 2018 omnibus spending bill. At the May 10 hearing, Zinke told Senate appropriators he supported a reauthorization of the program, but raised the prospect that maintenance concerns may be driving the administration’s thinking about the fund. “It’s hard to justify taking in more land when we haven’t addressed the maintenance problem of our current holdings,” Zinke said. Across all Interior Department public lands, the federal government has an approximate $16 billion deferred maintenance backlog. Most of that is contained in the National Park Service account, with a $11.6 billion backlog. But the budget request highlights where the real action happens: the appropriations process. Current law, dating back to 1979, authorizes the fund at $900 million a year, although due to inflation that number carried more weight than it does now. At that level, Congress has only appropriated the full amount twice — in 1998 and in 2001, both at the bequest of a public lands initiative by the Clinton administration. Most of the program’s history has seen appropriations between $300 million and $500 million. Appropriations more recently have trended toward the federal land acquisition side of the program and away from the state implementation side. For fiscal 2019, Senate appropriators set aside $425 million for the fund. The House bill allocates $360 million. Through fiscal 2016, the fund took in $38 billion. Congress appropriated $17.5 billion of that money over the life of the program, leaving about $21 billion unspent. That money has gone to the general treasury and likely has been spent on other purposes, although it exists for the fund in ethereal federal accounting books. So even if the program fails to earn an immediate reauthorization, it could still receive funding from Congress, although it would be unable to collect new receipts from its share of federal drilling revenue. Federal programs without up-to-date authorizations receive money constantly in congressional spending bills. But for land development groups and park planning efforts, which can take years to form and see through, the uncertainty of a program without an authorization can harm projects years in the making. “If you have a project that has federal LWCF money, private money and state matches, and if one of those legs of that stool goes away, the conservation outcome that the community and even the landowner wanted goes into jeopardy simply because they can’t rely on the government to keep its commitment,” Cors said. So conservation groups want to see the funding for LWCF become mandatory spending, avoiding dips in appropriations, he said. The idea has some traction with Bishop, who wants to see the state side of the equation with more reliable funding. Some of the funding already is mandatory resulting from a Gulf of Mexico revenue sharing law, but so far that money has been limited.